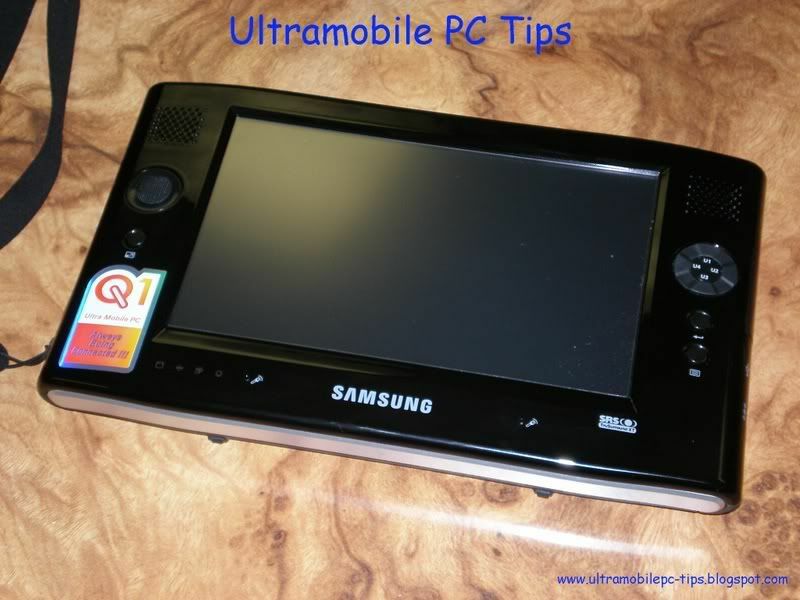 I was getting ready to write about Samsung Q1 and I started with a tittle of "CT's Samsung Q1 Review" but then I began to look into all the material that I was going to use in this review and I thought that in reality what I had in my hands was a comparison between these two machines. Now that I own both I think that I can give a fair opinion about them or at least I can't be accused of giving a better rate to my own device. Let's start with the box. The Q1 box gives you the feeling of opening something really refined. Like I said in one of my earlier posts, this box was made to attract buyers. 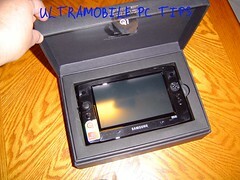 The Amtek T700 is ok but you can see that it's a lot cheaper design than Samsung's. This is a clear example of how to use the box of your products as a marketing tool. One of the first I noticed when I took in my hands Samsung Q1 was how light it was: 1.7 lbs. TabletKiosk eo v7110 weight is 1.9 lbs. 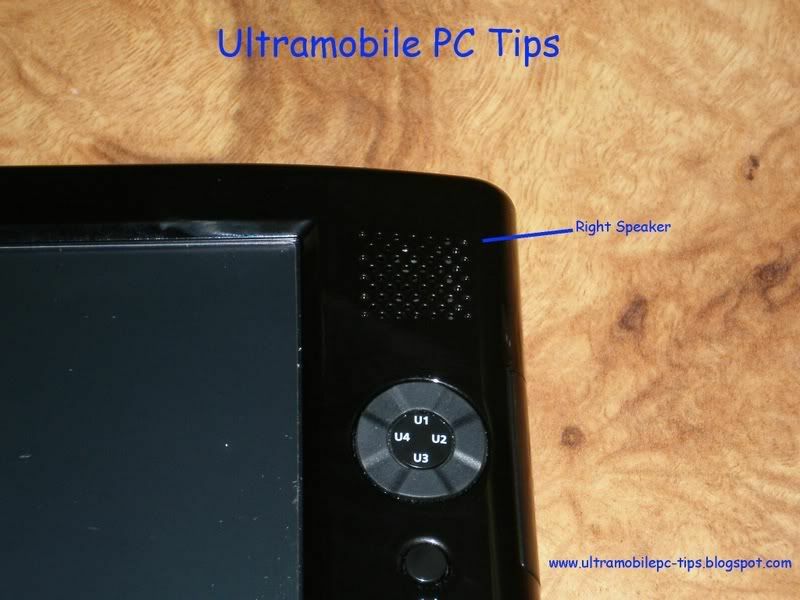 If you don't own yet a UMPC you wont understand yet what big difference makes these 0.2 lbs when you are holding one of these devices in your hand for a long period of time. The exterior design of Samsung Q1 is very attractive but to be honest I do not like how easy it get dirt with fingertips stamped everywhere. This is something that happens too in black color eo v7110s but not in the latest i7200 series from TabletKiosk and it's not that noticeable in white color v7110s like the one I own. 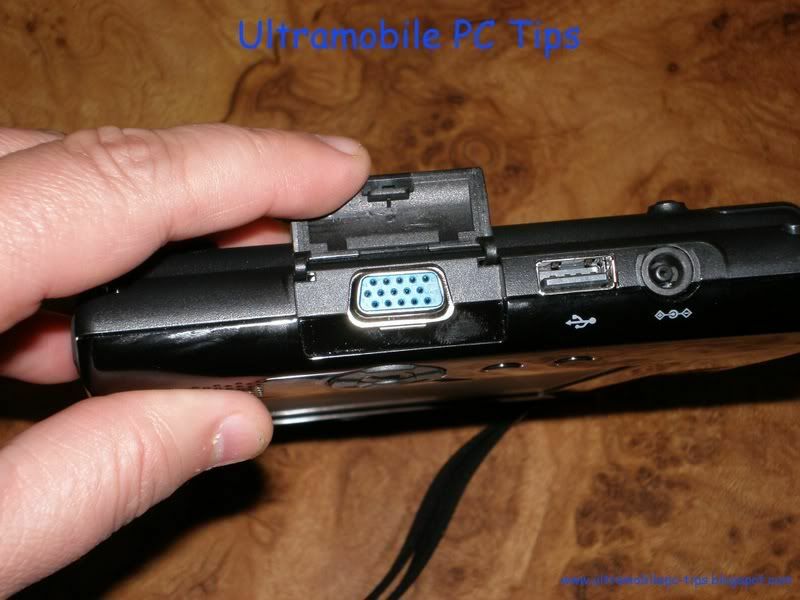 1- The integrated VGA Port. 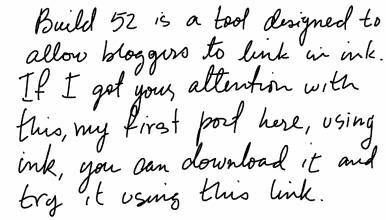 No because I use it too much but because I think that it's good to have it in case you want to show something in a bigger screen. This is definitely a good point for enterprise users. 2- The Integrated Ethernet Port. Believe it or not, still moments when you need to hook a portable PC to a LAN. 3- The Power Meter integrated in the main battery. This is a must have when you have more than one battery and you are getting old like me and have problems trying to remember if you charged what and when. 4- SRS Feature. The speakers in Samsung Q1 works a lot but a lot better than the single speaker of eo V7110. But it's not just the speaker. The software and Sound drivers used in Samsung Q1 are 1000 times better than VIA Sound Drivers and software. I have not been able yet to configure my eo to get rid of a annoying noise at the beginning of any sound. The SRS in Samsung Q1 work very well and I was surprised to see the stereo effect coming from two speakers that close located. 5- Two stereo microphones integrated with the unit. That's something that I do not use too much but for some people, to dictate a document will be a lot easier than to write it in this kind of machine. In another hand, there are situations where to speak a command is a lot easier than to tap in the screen few times. 6- Heat dissipation. 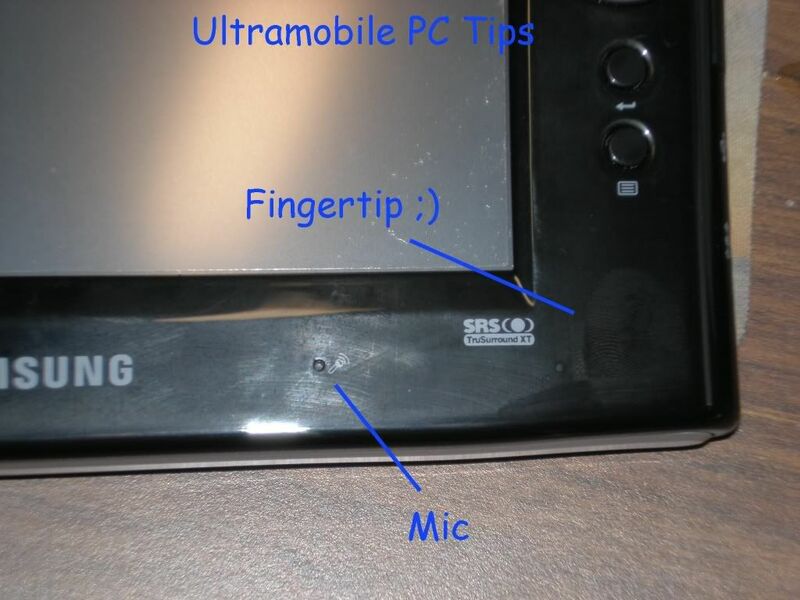 Samsung's Q1 has the fan located in the top right corner and blowing the hot air from inside and away from the User . The TabletKiosk eo V7110 has it in the left Upper side blowing the hot air right into user's left hand. And believe me that air get very hot in some occasions up to the point that it's uncomfortable to hold the eo with the hand on that way. The Q1 works a lot cooler than the eo v7110. These 6 points would make eo v7110 a perfect machine! Now, what I do not like. Samsung Q1 screen is too sensitive. I'm not saying that eo v7110 is better because it's hard to get anything done there using just your fingers. But I really think that something in between those two displays would be perfect. And if I have to go with one of them I'll stay with eo V7110 screen. Samsung's screen is so sensitive that your handwriting looks like the one of a 80 year old man with Alzheimer. A good illustration of what I'm saying is this ink note posted at JkonTheRun -I opted here to use James' note as an example to show that it's not an issue that I'm having alone. Compare that note with the above written in my eo and you will notice the difference in the lines. The absence of a joystick mouse in Q1 kills me. In my eo v7110 I can hover on top of objects to get the hidden extra information like tips, links, etc and that is almost impossible when you are using the Q1. You have to click on top of the object to move the mouse and that sometimes ends kicking you to do something that you don't want or to a place where you do not want to be. The other thing that I don't like is the way used to implement the Tab and Hold or right click in Q1. In my eo I get that animated circle and then the contextual menu; in Q1 you just get the menu like in your PC when you do the right click. These two issues - the absence of mouse and the high sensitive screen - make the experience of writing documents not that pleasant as in a TabletKiosk eo v7110. At least for me. Before we start comparing numbers lets say few words about these two machines. When a machine is designed the engineering team have a specific goal to reach and everything on that machine is put in there to help in that mission. If you want a machine for multimedia you are going to want two speakers, good microphones, a processor good enough to handle any video player and a video chip good enough for this same task. If you want a machine to handle a inventory control in a warehouse, there you don't need two speakers, you don't need a microphone and you do not need neither a very powerful processor or a good video card. Do you follow me? 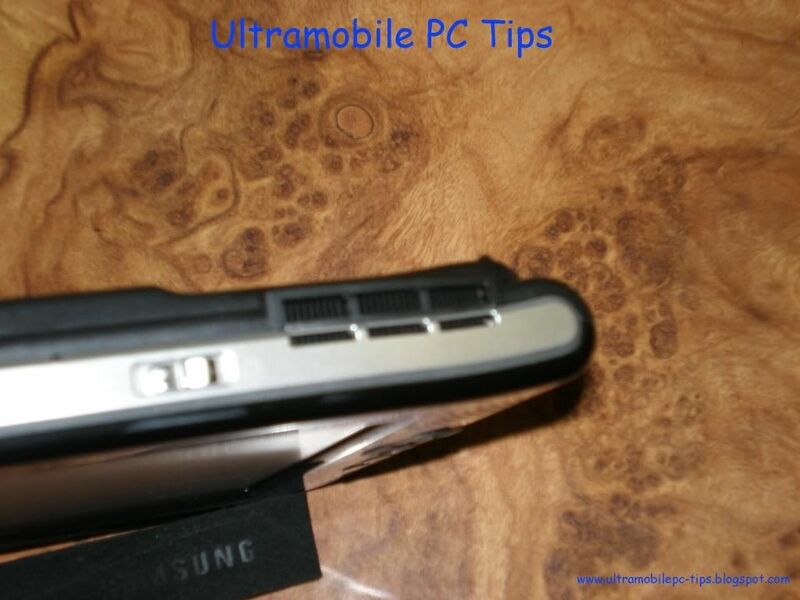 Because this is the case we have with Samsung Q1 and TabletKiosk eo v7110. 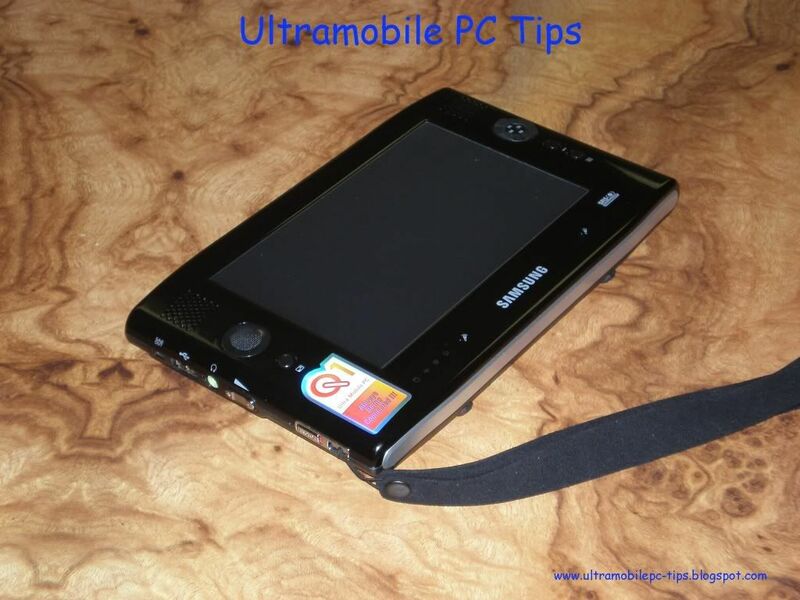 The Samsungs Q1 that I have uses a Intel Celeron Processor running at 900 Mzh. The TabletKiosk eo v7110 uses a VIA C7 processor running at 1 GHz. Q1 use a 915 GMS Intel-GMA900 chip with 128 MB of Shared Memory while the eo V7110 uses the VN800 from VIA with only 64 MB of Shared memory. 128 vs 64 of Shared Memory partially explains why Q1 is a lot better playing all kind of movie formats. Now lets start comparing numbers. 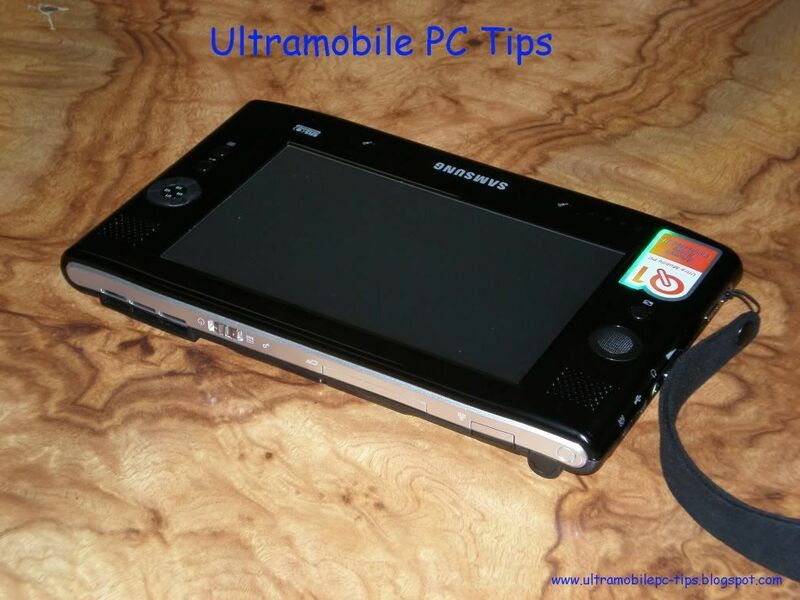 The Q1 can compete in this department with the TabletKiosk eo i7210 but the v7110 is not an adversary for these two UMPCs with Intel Processors and Video chips. While the 3D mark test was a very pleasant experience in Q1, in the eo, it skipped some tests because the video card did not support them. To complete my tests I ran one of the best benchmarks you can find and the only one designed for VIA processors: COSBI Open Source Mark. The Q1 performs around 30% better than Tabletkiosk eo v7110. is this a noticeable difference in real life applications? No unless you are playing videos. I have been working in my eo in all Office applications, in Visual Studio 2005, part of this review has been written in this device, I have even installed Vista, and I find the performance of eo to be enough to handle all these tasks. will the Q1 perform better in all these applications? Probably Yes. So, is the Q1 better? No. 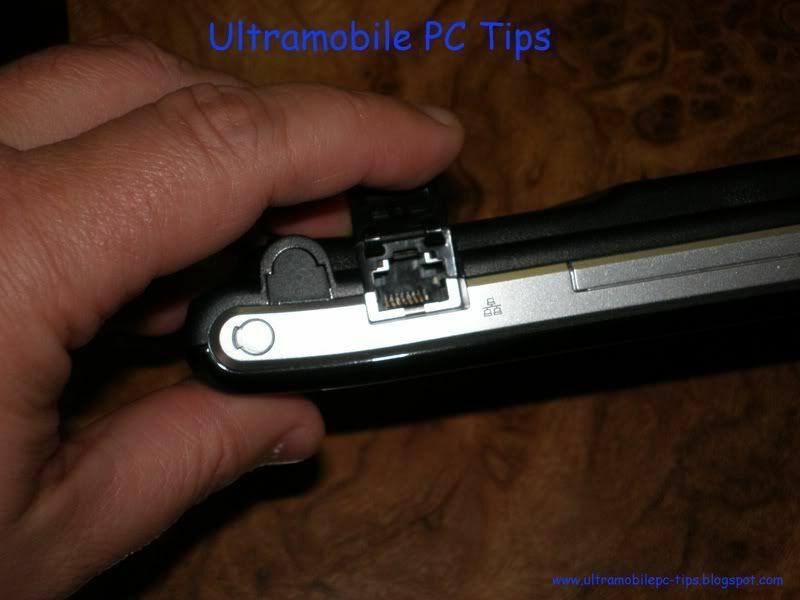 There is not such thing as the best UMPC. The Q1 is good in many things but I find the button layout, the screen sensitive and the joystick mouse more important features for me than all those present in the Q1. I use for long period of time my eo holding it with my two hands -PSP style - something that I can't do with my Q1. There are many things that each company could learn from each other, that's for sure. 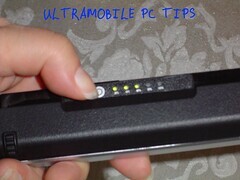 The Q1 is the best multimedia UMPC while eo V7110 is a perfect working machine. The eo v7110 have a lot bigger selection of 2.5" HDDs that can be installed on it and they are a lot cheaper than the 1.8" used in Samsung's Q1. And it's a lot easier to replace the HDD in an eo than in a Q1. This probably will make the eo the option number 1 for any IT Manager in charge of any large Production Company. The Samsung Q1 and the eo V7100 are two completely different machines targeting two different market share. You wrote "These 6 points would make eo v7110 a perfect machine!" I guess you mean "These 6 points would make Samsung Q1 a perfect machine!" No, if those details were present in eo it would be perfect. Very good ans very objective review ! I think also like hal 9000 : These 6 points would make Samsung Q1 a perfect machine ! AMtek can thank Samsung! Q1 with a trackpoint would have been a perfect machine. Have bin using Samsung for two month now and things you miss on Q1 are just a first week use anoyances which disapear after first week and Q1 is perfect for business (replaced lenovo x41 for me), entertainment (replaced Cowon A2 for me and iPod in the car, Xbox original to watch avi on projector). So Q1 - winner! If Your had used a track point you would understand how good would have been the Q1 with one of those and at least two more buttons. I'm pretty sure that Samsung left the track point out only so that they could try to force usto buy their very expensive keyboard, which has one included. Very annoying. Just got the SAMSUNG | NP-Q1-V002 and noticed that occasionally makes a clicking mechanical noise. Hard drive parking? Can't really make it out. Anyone notice this on their unit? Mine does the same sometimes. We're looking into getting either the Q1P or the ruggedized eo for outside fire suppression use and were wondering your opinion of the sunlight readability of the two screens? Any comments? You should go with the Amtek T770 which has a Outdoo/Indoor Display. The Q1 display needs to be at the highest brightness and even at that level it does not look good. Check my review about the Fujitsu P1610 where I posted a picture comparing the Q1 display with a Outdoor/Indoor Display used in this case in the P1610.